Team Wellington will finally have their name emblazoned on the OFC Champions League trophy after overcoming Lautoka 10-3 on aggregate over two legs in the final of Oceania’s premier international club competition. 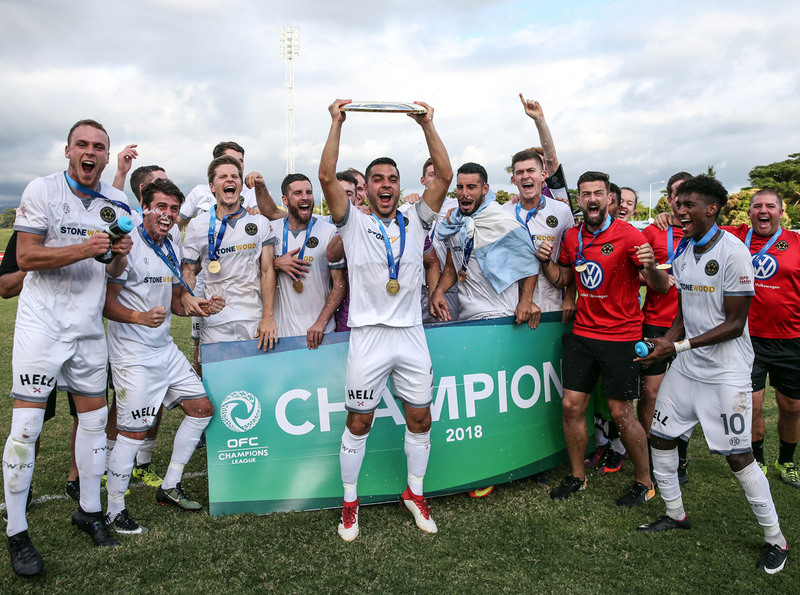 “I’m delighted, we’re still absorbing everything but after a season of tremendous hard work, to finally clinch the big one is a tremendous feeling,” Team Wellington coach Jose Figueira said at the final whistle following a 4-3 Leg 2 OFC Champions League final victory. Today’s win was a matter of course for the three-time runners-up who had done all but sewn up the title with their 6-0 romp past the Fijian club side at Dave Farrington Park a week earlier. Lautoka were already starting on the back foot after losing goalkeeper and captain Benaminio Mateinaqara to a shoulder injury for this match. The gloveman had an impressive campaign up until the first leg final against Team Wellington and was obviously disappointed not to be fit. In his place was Senirusi Bokini who initially appeared ready for the task but when he came off his line to clear a ball only to send it directly to his opponents it seemed it was going to be a long afternoon. Mario Ilich picked up the loose clearance and seeing the keeper off his line, looped in an excellent shot. Bokini scrambled back, getting a palm to the ball and keeping it out, but Dave Radrigai carried the ball over the line for the opener in just the 10th minute. There were thoughts that the early goal might see the floodgates open for Team Wellington, however this was a Lautoka side with renewed purpose keen to show the form that carried them to the final. Brian Kaltack, Benji Totori and Osea Vakatalesau led the charge forward for the home side, with several first half chances going just short of the target. However fortune was once more on the visitor’s side as a clearance made it only as far as Ilich on the top of the box who drilled a shot past Bokini for his side’s second of the evening. Both teams made changes at half-time and it was Team Wellington’s swap of Jack-Henry Sinclair for Ross Allen which proved more fortuitous as the Guernsey striker linked with Nathanael Hailemariam to find a third for his side in the 51st minute. Being three down seemed to be what Lautoka needed to fire them into action as Benji Totori took matters into his own hands, or feet as it were. Lautoka worked the ball into the penalty area before the competition’s leading goal scorer rounded a defender and keeper Scott Basalaj to add yet another to his tally. Shazil Ali was the author of Lautoka’s second goal of the afternoon with a beautifully curled effort landing in the top corner corner, just out of a diving Basalaj’s reach. Just a minute later Totori did what he does best, cutting through the defence and slicing across the goal mouth for his brace and the equaliser. With barely five minutes left in the match it looked like Leg 2 might be a well-deserved draw for Lautoka after an impressive comeback. But with their tickets to the UAE booked, Team Wellington wanted a clean victory to see them off to the FIFA Club World Cup. Enter Angus Kilkolly, who needed just one more goal to go equal with Emiliano Tade in the Golden Boot race, was left unmarked giving him plenty of time to pick a spot and scoop the ball into the back of the net for the winner. Lautoka’s second half comeback was pleasing for coach Kamal Swamy to witness as he saw the fighting spirit return to his charges. “I think we created a lot of opportunities, better than what we created in Wellington. Figueira said although the team had done a lot of the work for the final in the first leg at home, they didn’t come to Lautoka expecting an easy task. “We always knew, it’s so difficult to play away in the Champions League and that first leg was really crucial. We got off to a good start and it was more than expected, but we knew Lautoka was going to be a tough nut to crack and we got that in the second half. As well as taking out their maiden OFC Champions League title, Team Wellington were also rewarded for their outstanding individuals. After scoring the winner today, Angus Kilkolly equalled Emiliano Tade’s eight goals in the competition to earn himself the Golden Boot after playing less minutes than the Argentine. New Caledonia’s Roy Kayara was awarded the Golden Ball after a campaign of impressive performances for Team Wellington showing his nous and game understanding both defensively and offensively. Former champions Auckland City did not go completely unrewarded this year as they take home the Fairplay Award while goalkeeper Enaut Zubikarai, who conceded just twice in this competition, was awarded the Golden Gloves. Team Wellington have qualified for the FIFA Club World Cup in UAE where they will meet the winner of the UAE Arabian Gulf League, Al Ain.